Dare I say it... that Autumn is finally here? ... with Winter, less than a month away? ... and watching my lemons turning yellow, one by one... just confirmed that Autumn is definitely here. And it's time for me to harvest my lemons... and get the plant ready for the next season. With a box of raspberries that was sitting pretty in my freezer...plus I had the itch to bake, lemon and raspberries would make a perfect pair... 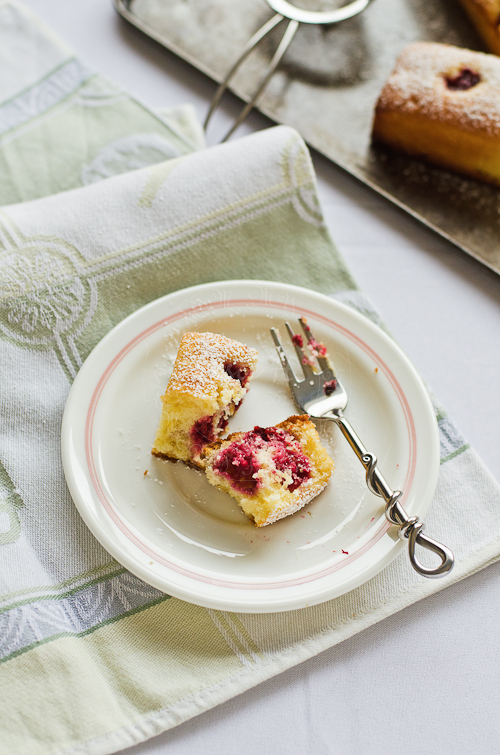 I searched the net for some good recipe... and came across Martha Stewart's Ligurian Lemon Cake. ...because it spells DISASTER.. .I am not good in either spreading anything on the cake or do a fancy piping onto cakes... plus it will be too super... duper... sweet.. much to my kids' delight ... ....definitely not mine!! Spray some olive oil onto the baking pan. In a large mixing bowl, rub the sugar and lemon zest until the sugar feels moist. Add in eggs, using whisk attachment, whisk until the mixture is pale and thick. Lower the speed, add in milk then flour, olive oil and lemon juice. Mix until all the ingredients is well blended. 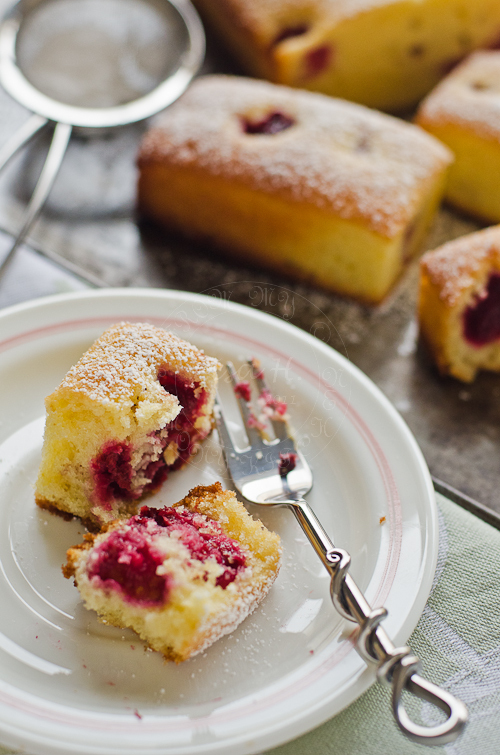 Pour one third of the batter into the baking pan, arrange raspberries on top of the batter. Repeat, and finish it off with the last layer of batter just covering the raspberries. Bake for 30-35 minutes or until the skewer comes out clean. Remove and leave it to cool on the wire rack before serving. This definitely be a healthy cake as it used olive oil. 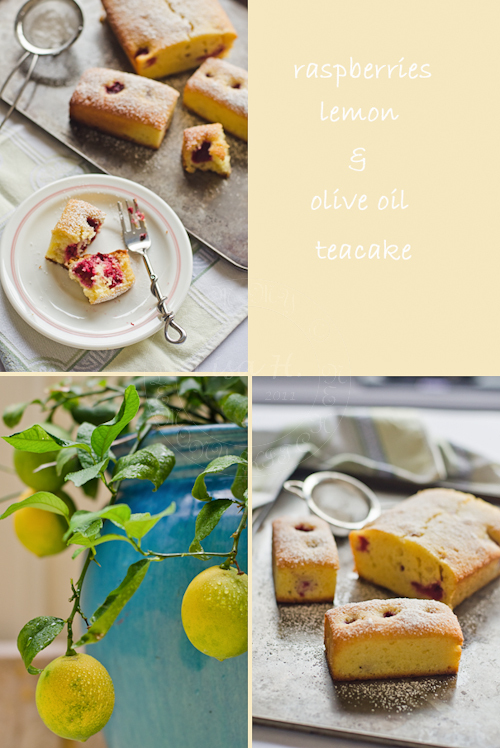 I have never used olive oil baking in my cakes before and I should try that too. I just loves all Martha Stewart's recipes. Your cake looks great and I think you made the right decision not to add the meringue, this is much more elegant. This sounds like an amazing cake. And looks like one too :-) Can I have a slice? perfect recipe for me to try later since i dont have butter now and all i want to do is to finish my lemon zest! Lovely tea cakes! Raspberries and lemon pair wonderfully well. A terrific combo. what wonderful tea cakes...loved the combination of lemon and raspberries...great clicks n presentation !!! That does look like a nice and healthy cake. I would have iced it to death! I love sugar! hehe. Super easy and looks so gooood! Love lemon and raspberry together and the pic is so pretty. I was so excited to see your post! Looks so gorgeous. You did it again Lisa... I love your photography and of course this teacake! the recipe sounds awesome but i absolutely adore the FORK! who makes it and where can i get it? Looks good! I have never used olive oil in baking, this sounds great!